This March we are thrilled to be having the American Tap Dance Foundation with us at the 14th Street Y Theater. They are bringing two exciting shows on March 19 to the 24th. The first is called Rhythm is our Business and the second is Rhythm in Motion. Here to give us a run down of the foundation and what to expect at the Y is the director and creator himself, Tony Waag. Tell us a little bit about the tap dancing programs. How did it get started? How did you get involved? I was fortunate enough to meet Brenda Bufalino in my home town Fort Collins Colorado in 1976. She was brought there by the dance department at Colorado State University to perform, lecture and teach, along with two other tap dance legends the late Charles “Cookie” Cook and the late Leslie “Bubba” Gaines. I had only dabbled in tap dance in High School and wanted to check it out. I remember being awestuck by all three performers. These artists were there to share with us the rich history of tap dance and also, the current state of an art form, an American art form. I remember being floored that Tap Dance had not been recognized as such, and practically dismissed for nearly 20 years! From that experience on, I planned on becoming a tap dancer. I visited New York City twice shortly afterwards, and then eventually moved here to reestablish that initial connection. Ironically, I literally ran into Brenda on the street the first week I moved to the big apple. We then started what has become a 37 year pupil/ mentor relationship. Why these two productions at the 14th street Y? What makes them exciting works? These two productions combined celebrate the art of Tap Dance and expand and challenge the limited perception that tap dance is considered either too old-fashioned or too commercial to be taken very seriously. There are many different styles of tap dance today, all valid, and all incredibly interesting, complex and diverse. Most people today have no idea that tap dance is actually practiced, presented and perfected all over the world. With these shows we celebrate and honor our past and then present the future of tap! A future that is exciting, fascinating and full of variety. What excites you about bringing the American Tap Dance Foundation to the 14th street Y Theater? The 14th Street Y is in the middle of Manhattan, and I live on 14th street. There are many good reasons, the staff is friendly and supportive, and the space is intimate and flexible. It’s a great venue for dance presentation. We hope this is just the beginning of a long and fruitful partnership! Click here for info about Rhythm is our Business. Click here for info about Rhythm in Motion. 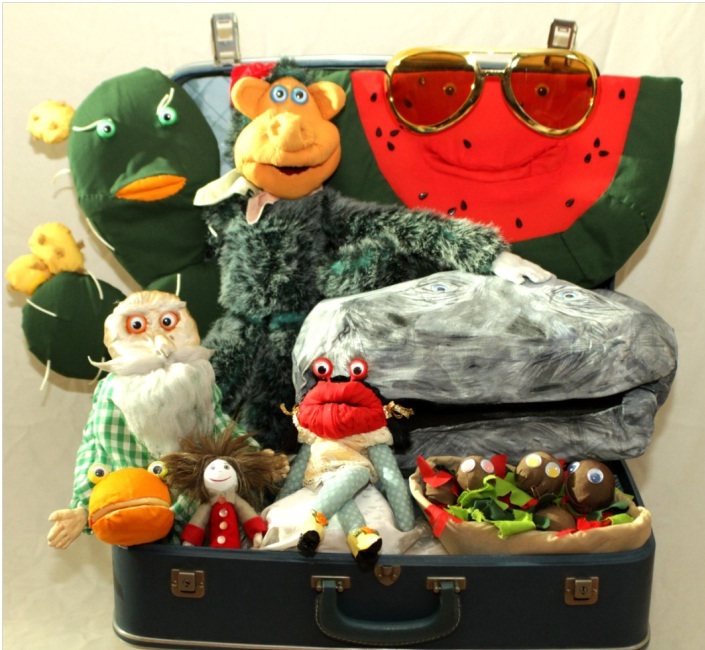 This Sunday, March 17, 2013 from 11 am – 1 pm, LABA Kids at the 14th Street Y presents Lost & Found in Israel, a puppet show developed by Israeli artists Zvi Sahar and Leat Klingman at the Theater at the 14th Street Y. 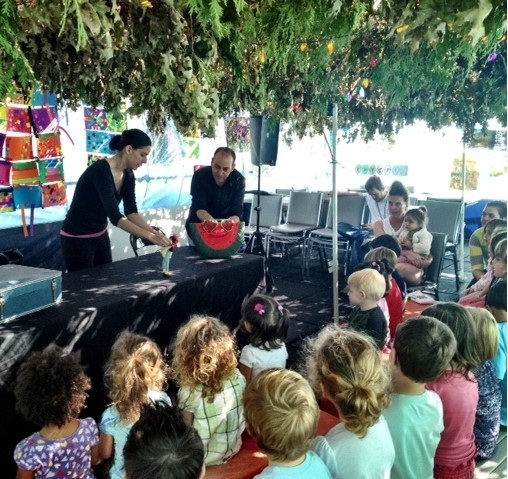 Families will learn about Israeli culture, and our expert puppeteers will teach them how to create shadow puppets they can use at home with a flashlight or table lamp, in the shapes of fruit like the puppets in the show. “We made that show from all the things we love and miss in Israel – the land, the people, and of course – the food!” explained creators and performers Zvi Sahar and Leat Klingman. Zvi Sahar is an Israeli born actor, director and puppeteer. He is also an alumnus of the LABA: House of Study at the 14th Street Y, where he developed an innovative piece of live puppet cinema, Salt of the Earth, which has received the Jim Henson 2013 Foundation Project Grant. Leat Klingman is a puppeteer-filmmaker, artist and musician. Her new feature film, Wolfy’s Journey, is a puppet-musical feature film. Join our puppets on a magical journey to Israel this Sunday, March 17th 11 am – 1 pm at the Theater at the 14th Street Y. Bring some of the magic home with you with your own shadow puppet and some Israeli chocolate! A look at the Teen Theatre Summer Institute from a recent Alum! Summer is right around the corner and that means our Teen Theatre Summer Institute is coming up! To learn more about it we have asked Teen Theater Summer Institute Alum, Heather O’Donovan, to give us a little insight on her experience in the program and get us excited about this upcoming summer! How did you hear about the Teen Theatre Summer Institute? I heard about the Teen Theater Summer Institute through BBYO, a Jewish teen leadership program . What were some standout moments for you at the Summer Institute? Some of my favorite moments during my experience at TTSI were our impromptu dance parties during lunch. The whole day at TTSI was structured in a really fun way, but I thought it was awesome that I and all of the other students had become close enough friends that we could make our own fun during lunch and have dance parties, sing-alongs, or talk about anything we wanted to! It was amazing that we could have so much fun together despite only just having met each other. So what are you up to now? And did the summer program help you get there? I am currently enrolled in my freshman year at Princeton University. TTSI definitely boosted my confidence for my acting and singing abilities, and this is something that has helped me at auditions and performances at Princeton. What advice would you give teens interested in joining the program? If you are at all interested in participating in TTSI, go for it! TTSI was an incredible experience and I am so glad to have taken part in it. From the first to the final day of the program, I saw the confidence and abilities of every student, including myself, grow by leaps and bounds. I also made great friends that I still keep in touch with now, even though the program ended months ago. These lasting friendships, along with the growth of confidence and ability, are something unique to TTSI, and anyone who is even remotely interested in this program should definitely apply! How could we learn more? Visit the website by clicking here! Click here to find out how to register now. Ronit Muszkatblit is the co-artistic director of LABA, a secular Jewish house of study and culture laboratory at the 14th Street Y. Today she is talking to us about LABAlive’s upcoming event, “Drunk” which will take place Thursday, March 14 in the Theater at the 14th Street Y. So explain to us a little about “Drunk.” I presume there is more to it than just drinking. Ronit: Yes! The evening will be an exploration into what ancient Jewish texts, like the Torah and Talmud, say about the state of being wasted. Our wonderful LABA teachers, Ruby Namdar and Basmat Hazan, will be talking about how Noah became the world’s first drunk, why sometimes wine drives you to heaven and sometimes it drives you to hell, and what happens to Talmudic rabbis when they drink too much. And people will be just drinking while they talk? Yes, but more. We have hired a professional sommelier to actually pair each of the texts being taught with a specific wine. Some call for something bubbly, and some are smokey and oaky and call for a deep red. Before we look at the texts, the sommelier will be telling us a little something about the wines he chose and why he chose them. Your program is for culture-makers. Will they be doing anything on the subject of intoxication? For sure. Current and past LABA artist fellows — these are the people we choose to join us in our house of study each year — will be performing and presenting works tied to ups and downs of getting wasted. We have award-winning playwrights Karen Hartman and Misha Schulman performing short theater pieces, and a short film by Zvi Sahar. Also, we will project art by Sam Holleran, Manju Shandler and Anita Glesta on the walls as we study. Oh, and Erin Patinkin, founder and owner of Brooklyn’s popular Ovenly will be creating a boozy baked good for the night. Why did LABA decide to produce this evening? We are very excited about the juxtaposition of culture and ancient Jewish texts in a totally open-minded and free setting and we are constantly looking for ways to bring what we do in our house of study to the public. Previously, we only had a year-end festival, but now we are expanding and doing events throughout the year. LABA is a laboratory for Jewish culture in which we use classic Jewish texts to inspire the creation of new art. Developed by the 14th Street Y in 2007, LABA programming includes a secular house of study, artist fellowship program and LABALive, a series of performances, public events, and gallery shows for children and adults. 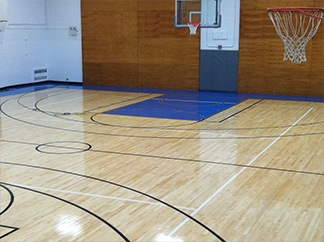 We hope you’ve had a chance to play or take class on our new Basketball Court! Your support has been invaluable during its renovation. Since you didn’t get to see the process over the last few weeks, we wanted to share some pictures of the gym’s journey from drab to fab! 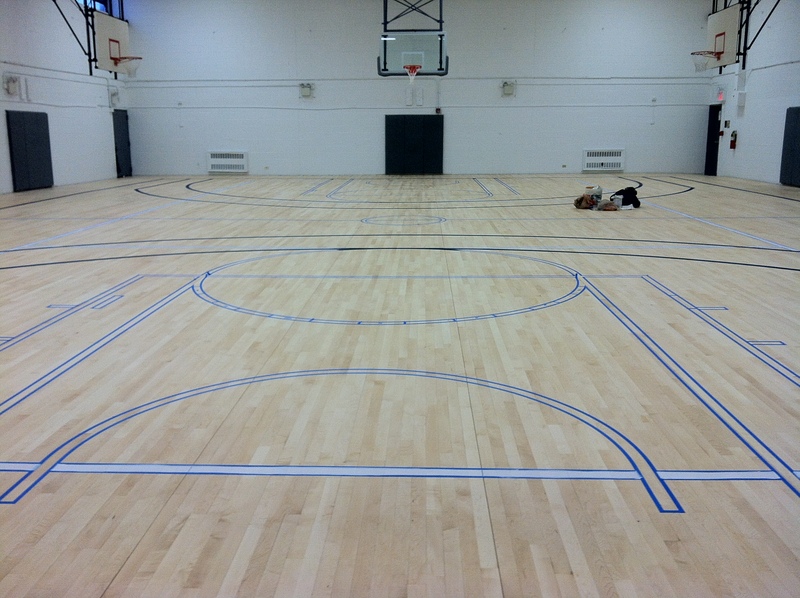 Here is our beloved old basketball court. It served us for 16 years with many fabulous games, classes and fun. But change was needed! And since we were changing…. Why not get the best? 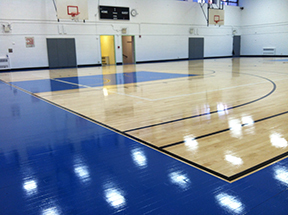 Our new gym has a shiny new wood floor (state-of-the-art!) fresh paint, and repaired ceiling. The new floor on its way in! Wood prepped and ready to paint. Here’s to many more years of legendary play! Thank you, 14th Street Y community for your patience and commitment to this important project.